The concrete wall can be used for fencing of buildings, squares, etc. 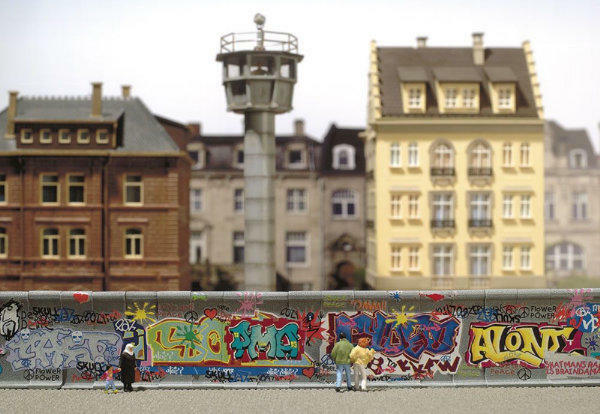 or as a GDR border wall (eg in connection with the Busch Wachturm 1015). The wall consists of 12 mm wide and 35 mm high individual segments, which are strung together. Total length 57 cm. Delivery incl. Cut-out sheet with warnings (border) or typical advertising signs and posters. The individual elements correspond to the support wall elements type UL 12.41 of the »new« wall from 1979/80 and also have the typical concrete wall bevels in the foot area in the model. An original wall element is 3.6 m high, 1.2 m wide and weighs about 2.6 t.